ISTANBUL --- Recently, Turkey’s forward-basing posture has started to draw more attention due to Parliament’s fast-track legislation to ratify a bilateral defense treaty with Doha which allowed the stationing of Turkish troops on Qatari soil. Notably, the timeline for deploying troops to Qatar overlapped with forward-basing in Somalia, as well as the administration’s plans to launch a light aircraft carrier. Turkey’s forward-basing posture can be best depicted as a modular and complex adaptive system, with many individual working parts with their inherent parameters in nonlinear interaction. In this regard, Turkey’s forward-deployed contingents and bases differ in characteristics, political-military raison d’etre, the way they serve Ankara’s foreign and defense policies, and their resiliencies in the face of regional fluctuations. Such forward military deployments are an integral part of Turkey’s strategic posture in the 21st century. With this more widespread positioning of its assets, ranging from the Eastern Mediterranean to the Horn of Africa, Turkey has been building its sphere of political-military influence to promote a robust regional security architecture. The Turkish forward presence in Qatar remains a breakthrough. When first designed, it was about graduating Ankara to a whole new level of national capacity. Evidently, back in 2015, when the administration agreed with Doha on establishing a large base, some experts assessed that, with this move, Turkey was augmenting its soft-power-driven influence in the Gulf with hard-power elements. Furthermore, according to this view, permanent basing would mean anchoring the Turkish-Qatari strategic partnership in an unpredictable and rapidly changing regional security environment. Fast-track parliamentary ratification has shown that Ankara saw its burgeoning strategic ties with Doha as an indispensable part of Turkey’s geopolitical agenda. Turkey’s decision to ratify the treaty and then rapidly deploy troops to Qatar was not an anti-Saudi move, rather a pro-Qatari one. This is a complex but an important nuance to understand Ankara’s perspective in the Gulf. If everything goes as planned, by the 2020s, a brigade-level joint force, which means a few thousand troops from all branches of the Turkish military, will be stationed in Qatar. Indeed, that could be a regional game-changer. Although one brigade is a small contingent for Turkey given its armed forces’ extensive human resources, possible deployment of some 3,000 or even more Turkish troops would be tantamount to nearly one-third of the active Qatari military personnel, and alone exceeds this small Gulf nation’s navy’s or air force’s manpower. The Turkish forward-basing in Somalia is an integral part of Ankara’s Africa initiative, which is intended to boost Turkey’s smart-power capacity throughout the continent. Somalia has been at the epicenter of Turkey’s geopolitical perspective in the 2010s. The new military base enjoys a key location in very close proximity to Mogadishu’s airport, its port and a hospital built by Turkey in 2013. The base will occupy 400 hectares with several training grounds that would cost around $50 million. While it was initially reported it would be able to train 500 Somali troops at a time -- a battalion-level force -- recent news reports suggest that it will host 1,500 Somali personnel, and a 200-strong Turkish forward-deployed force will serve in the facility. Turkish officials reported that the contingent’s main objective would be partner capacity-building amid Somalia’s troublesome security environment dominated by the al-Shabaab threat. Notably, Turkish Airlines has been the only non-African airline connecting Mogadishu to the world on a regular basis. Although commercial flights to Somalia might seem like an economic and prestige-building issue, maintaining logistics would be an integral part of sustaining the contingent. Another key aspect of the Turkish forward-basing in Somalia is the Turkish Armed Forces’ unblemished record in its missions abroad. This is of utmost importance in the Horn of Africa given the abuse and human-rights accusations surrounding African Union Forces. The most important drawback for the Turkish forward-deployments in the Horn of Africa would be the al-Shabaab threat. The terrorist group has directly threatened Ankara and openly labeled Turkey as an enemy. Furthermore, the United Arab Emirates (U.A.E. ), Ankara’s primary competitor in the ongoing Qatar crisis, has been trying to expand its presence in the country through deals with Somaliland (a self-declared state internationally recognized as an autonomous region) for using Berbera Port in return for training local security forces, since the port could be a boost for the U.A.E.’s operations in Yemen. The U.A.E.’s move drew harsh reactions from the Mogadishu government, which saw the deals with breakaway Somaliland as illegal and in violation of Somalia’s sovereignty. Nevertheless, the forward-basing in Somalia remains a true opportunity for Ankara in case the security risks could be managed smoothly. The Mogadishu government’s bilateral ties with Turkey have been growing for some time, which brings about additional opportunities as well as key responsibilities. In this respect, the base is expected to play a significant role in promoting Turkey’s strategic posture in the continent. Turkish forward operating bases (FOB) in northern Iraq and Syria are very tangible and deterrent manifestations of Ankara’s security concerns beyond its immediate borders. Following the seven-month Operation Euphrates Shield, Turkey managed to clear some 30 kilometers (18 miles) of territory in the northern plains of Syria from terrorist Daesh elements. Since then, the Turkish Armed Forces’ elite formations have been stationed in these areas, including the town of Al-Bab. Although there is little open-source information about the Al-Bab basing, publicly available evidence suggests the number of Turkish troops might be reduced to some 1,500 from 8,000, which marked the peak of the Euphrates Shield incursion. Some press sources hint at additional Turkish forward deployments close to Azaz. Top Turkish government figures previously said Turkey has already been operating a base close to the Ayn al-Arab [Kobani] area, and Ankara is to build a gendarmerie and a general-purpose military base centered on the Aqil Mountain where the fiercest clashes took place. The mountain remains the most important geostrategic high-ground overlooking Al-Bab. According to open-source information, contemporary Turkish forward military basing in northern Iraq is centered on a reinforced battalion-level armored unit in the Bamerni airport. Elite commando units are also stationed in Kanimasi and a few villages (i.e. Begova) to prevent terrorist infiltrations into Turkish territory. Besides, it is known that Turkey has a training mission in Bashiqa for anti-Daesh counterterrorism operations. A new normal has been shaping the Eastern Mediterranean on the basis of energy geopolitics competition by the littoral states, coupled with the Russian navy’s return to the region and the ongoing Syrian war. Growing submarine activity, more assertive naval modernizations, and combat missions have dominated the Levant’s agenda in the 2010s. Ankara has been transforming its coastal navy into a blue-water one. The crown jewel of the Turkish naval strategic posture in the 2020s will be the forthcoming Landing Helicopter Dock (LHD), TCG Anadolu. During the launch ceremony for the TCG Kinaliada, the fourth vessel of Turkey’s indigenous MILGEM-class corvettes batch, President Recep Tayyip Erdogan stated the Turkish Navy would soon operate an aircraft carrier. In fact, recent news about Turkey’s Landing Helicopter Dock project suggests Ankara has been planning to build a ski-jump runway for its future LHD, which will enable her to operate F-35B short takeoff and vertical landing (STOVL) multirole fighters. The Turkish Navy has not operated carrier-based naval aviation before. If TCG Anadolu is to be modified as a light aircraft carrier, this would be the first time that Turkey will run a ‘floating base’ in blue waters. Operating such a vessel would provide flexible military options to the Turkish government in pursuing a strategic overseas agenda. If Turkey manages to build some fixed-wing naval aviation capabilities, then it will not be limited to relying on homeland airbases. Having either a (mini)carrier strike group or an amphibious ready-group would provide Turkey with significant political signaling and military muscle-flexing advantages. Sending TCG Anadolu and her naval battle group to a crisis zone would enable Turkey to combine hard power with its diplomatic rhetoric. Furthermore, gaining such a blue-water capability would also mark enhanced naval diplomacy capacity for Ankara. Naval diplomacy enjoys a broad-spectrum of missions ranging from port visits and exercises for building partnerships, to conducting patrols and even coercive efforts. Yet, Turkey’s Undersecretariat for Defense Industries (SSM) reports that the project is planned for acquiring only one platform. Simply put, in doctrine and practice, carrier strike groups and amphibious ready groups are operated on a rotational basis. For instance, the Australian Navy plans to operate two Canberra-class (originally Juan Carlos-1 class) LHDs, HMAS Canberra and HMAS Adelaide, for ensuring sustainability of its amphibious outreach. Likewise, the British Royal Navy will operate two aircraft carriers of the Queen Elizabeth-class, HMS Queen Elizabeth and HMS Prince of Wales, to maintain its naval strategic posture. On the other hand, the Russian Navy lost almost all of its naval aviation capabilities in Syria when Admiral Kuznetsov aircraft-carrying cruiser was homeported for a major overhaul following its three-month deployment off the Syrian coast. Therefore, if Turkey actually plans to become a power-projecting actor, it has to ensure some rotational deployment capability by having a second vessel to operate when the first one is homeported. Forward-basing is likely to build robust strategic cultural ties with the host nations. Furthermore, forward operating bases in Iraq and Syria have already provided Ankara with tactical depth and critical leverage in its cross-border operations. 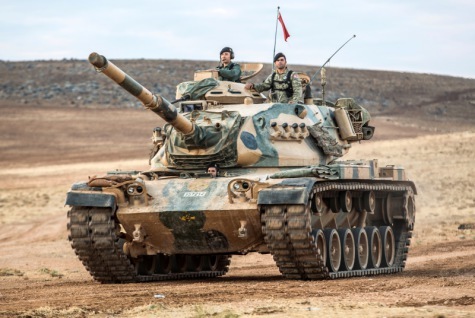 Without these assets, the Turkish Second Field Army’s area of responsibility – the frontiers of Iraq, Iran and Syria -- will remain extremely vulnerable to asymmetric and hybrid threats. At sea, the light aircraft carrier project will foster Turkey’s influence, especially in the Mediterranean, by marking a turning point in the Navy's history. All in all, a carefully-planned forward-basing strategy could give a real boost for Ankara despite possible drawbacks that need to be managed effectively.